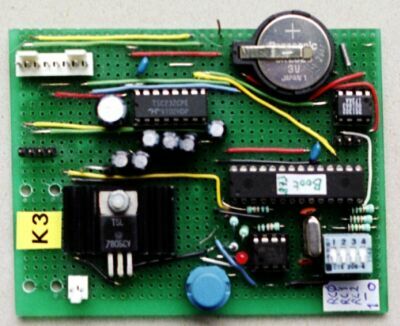 The K3 testboard is used for building various experimental circuits. It contains a 28 pin socket for the 16F873. K3 is a stripboard with predrilled holes. K3 measures 10 cm x 8 cm. The main components are: A 7805 bolted to a small heatsink, a blue reset button, a red LED, a serial I2C EEPROM (24LC256), four DIL switches, the 16F873 with 4 MHz crystal oscillator, a real time clock (DS1302) with lithium battery backup and a MAX232 for serial communication. I'm using an external power supply which is able to provide 12V DC at 300 mA.